The U.S. average retail price of diesel dipped 0.3 cent to $2.912 a gallon, marking its first decline in more than a month, the Department of Energy reported Nov. 20. Diesel now costs 49.1 cents more than it did a year ago, when it was $2.421 a gallon, the agency said. 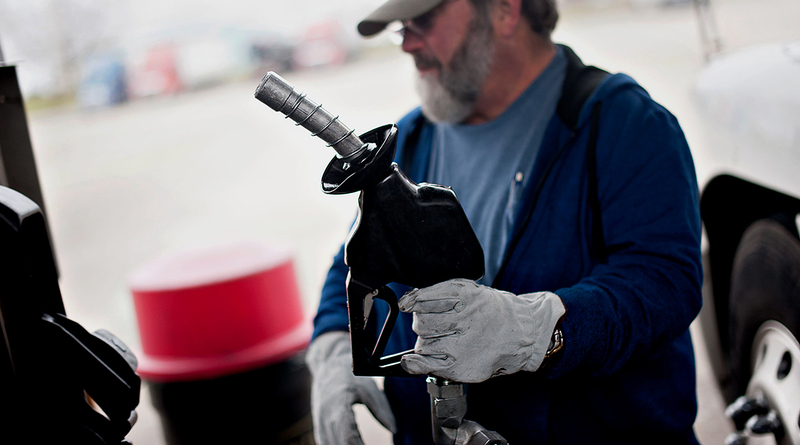 It was diesel’s first decline since it dropped 1.6 cents to $2.776 on Oct. 9. Average prices for trucking’s main fuel fell in six regions and rose in rose in four others. Meanwhile, oil slipped some but it remained above $56 a barrel. And the U.S. average price for regular gasoline fell 2.4 cents to $2.568 a gallon, and was 41.3 cents higher than it was a year ago, DOE’s Energy Information Administration said. Average gasoline prices fell in all regions, except two — the price was flat in the Rocky Mountain region, and up 0.2 cent in the West Coast-less-California area. West Texas Intermediate crude futures on the New York Mercantile Exchange closed at $56.09 on Nov. 20, compared with $56.76 on Nov. 13. The global demand for diesel to fuel trucks and buses will increase by 2 million barrels a day through 2040, according to the International Energy Agency. However, “A strengthening tide of industry initiatives and policy support pushes our projection for the global electric car fleet up to 280 million by 2040, from 2 million today,” said IEA in the report, which was issued Nov. 14 — two days before Tesla Inc. debuted two battery electric Class 8 daycab models scheduled for production in 2019. But unseating diesel as trucking’s primary fuel won’t happen soon, one analyst said. “I wouldn’t be selling my diesel stocks or trucks just yet. But we do know there are going to be more choices in the future. From a business standpoint, the question is what is going to be economical,” Phil Flynn, senior energy analyst at The Price Futures Group, told Transport Topics. Flynn, who disclosed that he owns stock in Tesla, said the company’s ability to bring cheap electric cars to the market isn’t quite there yet. “One would assume that an economical truck that would take over a big chunk of what we have got going on the ground is going to take a while. So, is it going to be something in our future? Absolutely,” Flynn said. About 1.2 million Class 8 trucks — or 30% out of the total 4 million heavy-duty trucks operating in the United States — use the newest-generation clean diesel technology to meet the stringent emissions standard established for new trucks sold beginning with model year 2010, according to the Diesel Technology Forum. “Diesel technology is not standing still but rather being enhanced every day across a wide range of applications. From coupling with hybrid-electric technology and battery storage systems, to pushing thermal efficiency boundaries, to utilizing 100% non-petroleum bio-based diesel fuels, the new generation of clean diesel power is part of a sustainable future,” Allen Schaeffer, executive director of the Diesel Technology Forum, said in a statement. Also, Flynn said providing enough electricity for transportation is an issue. The latest shifts in fuel and oil prices came as talks to form a new government coalition in Germany stumbled. The resulting uncertainty raised questions about the future of Europe’s biggest economy. Then that uncertainty helped strengthen the dollar, which tends to depress oil prices, Bill O’Grady, chief market strategist at Confluence Investment Management in St. Louis, told Bloomberg News. Also, doubts persist about whether Saudi Arabia-led cuts in production will be extended, according to Bloomberg. The Organization of Petroleum Exporting Countries has scheduled a meeting for Nov. 30 to decide whether to extend its production cuts beyond the current March expiration.